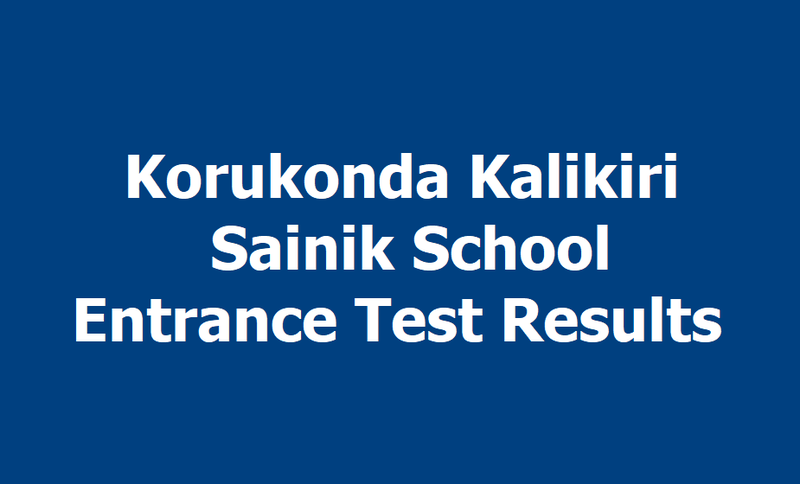 #Sainik Schools Entrance Test final results 2019, Korukonda, Kalikiri Sainik School Entrance Exam 2019 Final Results/Written Exam 2019 Selected List : Korukonda Sainik School Officials issued Korukonda Sainik School Entrance Examination Notification 2019-2020 in the month of October, 2019 for admission into 6th Class and 9th Class in Sainik School, Korukonda, Vizianagaram District and admission into 6th Class in Sainik School, Kalikiri, Chittoor District. Both Sainik Schools invited applications in the month of December as per its schedule form the eligible students for admission into 6th class and 9th class for the academic year 2019-2020. Korukonda Sainik School Officials successfully conducted Entrance Examination on January 06th, 2019 .So, the candidates who were appeared for the entrance exam, they are waiting for their results. Now, Korukonda Sainik Principal will announce the results of School Entrance Examination 2019 in the of February 2019 after completion of valuation of answer scripts. Candidates who qualified would have to appear for interview and medical examination on the dates intimated through call letters sent individually by post, according to Principal of Sainik School Korukonda Group Captain said. The interview/ medical examination are likely to be conducted in the month of May. Candidates who have not received the call letters may contact the school on the phone number. The examination has been conducted for filling 90 vacancies in Class VI and 25 vacancies in Class IX. The results are also available on the school’s website. AISSEE-18 results have been declared on midnight of 7th Feb 18. 1. The following pdf file is the list of Roll Numbers of candidates who qualified in Written Examination held on 08 January 2019 for admission to Class VI and Class IX in Sainik School, Korukonda. 2. They will be required to appear for Interview and Medical Examination at a later date intimated through call up letters by post. Interview / Medical Examinations are likely to be held in February as per schedule for Kalikiri Sainik School and Interview / Medical Examinations are likely to be held from 11-02-2019 as per schedule for Korukonda Sainik School and more details in Results list. 5. The school will not be held responsible for any postal delay / printing errors in the Newspapers. The results held with the school will be final and binding in case of any Discrepancy / Errors in printing. 6. The Roll Numbers are serially arranged and not as per merit. #Korukonda Sainik School Entrance Exam Website. The following is the list of Roll Numbers of qualified candidates in All India Sainik Schools Entrance Examination held on 07 Jan 2019 for admission to class VI in Sainik School Kalikiri. They will be required to appear for Interview & Medical Exam at later date to be intimated through call up letters by post. Interview & Medical Examination are likely to be held in February, 2019. Candidates not in receipt of call up letter for interview in February 2019 should contact school on telephone number 0877-2500270. The school will not be held responsible for any postal delay/printing errors in the News Papers. The results held with the school will be final and binding in case of any discrepancy/errors in printing. The roll numbers are serially arranged and not as per merit. The result is also available on the School Website www.kalikirisainikschool.com. The interview schedule will also be uploaded on School Website in February 2019. The following is the combined list of selected candidates category wise in the order of merit (row wise) for admission into Classes VI and IX for the year 2019-2020 into Sainik School, Korukonda. Merit List is prepared without taking into consideration "Medical Fitness" of the candidates. Unfit candidates are being informed individually. They may appeal against the medical unfitness as per rules. The admission is subject to medical fitness and submission of all certificates by the candidates. Candidates not in receipt of call up letters for admissions should contact school on Telephone No. 08922-246119. The school will not be held responsible for any postal delay / printing errors in the newspapers. The results held with the School will be final and binding in case of any discrepancies / errors in printing.